As promised, the final installment from Where Attention Goes, Energy Flows, (Part 1, Part 2), is finally here! The timeliness of this segment was deliberately set to coincide with our yearly celebration of thankfulness for all that life has to offer on our journey through it. Enjoy! For two hours Janis Ian sang to us through the trials and tribulations of her musical career. For such a diminutive and unassuming exterior, her vocals still packed a soulful punch at all that she had lived through. She ended the concert early in order to get ahead of Hurricane Irene, who was menacingly stalking the east coast at the moment. Thoroughly exhausted, I arrived home from the concert, cared for the horses and poured myself into bed. The events of last night, the morning and the afternoon seemed as if they had taken place months ago. However, my tender emotions reminded me that the whole surreal ordeal was quite current. I fell asleep quickly, but woke up frequently as the reality of losing Murray began to seep in and take hold. The next day dawned with rain, wind and overall dreariness, a perfect companion for grief. My first task, after caring for the horses, was to call Michele. “Hi,” she said in a low voice after recognizing my number from caller I.D. For a split second I thought perhaps she already knew. “What do you know?” I asked hastily. “I am so sorry to have to tell you this, but we put Murray down yesterday afternoon,” I sobbed into the phone. Next, I blurted out the whole story as quickly as I could so that her emotions could catch up with mine. The words drilled a hole through Michele's heart. But typical of Michele, she tried to comfort me through her tears while assuring me that she had no doubt Murray was in a better place. For most of the day I remained in the house, having only tended to the necessary care of my animals in the barn. They spent the day in clean stalls munching hay while waiting for the gale force winds and driving rain outside to subside. In the kitchen I wrote at the computer while Rod pickled an overabundance of cucumbers from the garden. Meanwhile, Vicky having started out for the barn from her house in Otter Lake, was forced by her emotions and gusts of wind to turn around and go home. Murray’s loss hit the rest of our barn 'family' hard. A young girl named Haley had been the last one to ride him on the morning of the day he became ill. She was concerned that this had been the cause of his demise. I wanted her to know how grateful I was that she was the last one to ride him so that he had left us on a high note, as the fabulous teacher we knew him to be. Alex, (Wings for Alex), was going to have to forge a relationship with a new mount for her lessons as a result of losing her favorite horse. Of course Michele had lost her best friend, making us all wonder who could ever fill that void! And me? I couldn't wait to get back to school, away from the barn that was choking with sadness. Instead, I needed a new view from the windows in my classroom, where I could look out and put this event into perspective before allowing myself to move on. Unlike the closure that I felt for Windy and Spy, Murray's death left me profoundly sad. He had been the 'Giving Tree' in Shel Silverstein's beautiful children's story with it's blunt message about selflessness and selfishness. I felt that I had somehow failed the big horse. It was not surprising that Murray’s obituary on Facebook collected over 30 comments. They provided great comfort by reminding me just how many lives the handsome bay boy had touched. On Labor Day weekend when Meg and her girls arrived, they never mentioned the mare to me. Out of respect for losing Murray, Meg left the horse completely out of our conversation. As September and the new school year provided a much needed distraction from Murray’s death, I began to contemplate the acquisition of the mare to fill the vacant stall. By Columbus Day weekend, Meg and the girls were on their way back to the Adirondacks for some much needed therapy at the barn with the horses. This time I initiated the conversation. Meg couldn't talk fast enough, and whatever she said changed everything for a Thoroughbred mare named Makia. A lengthy discussion between Deb, (the mare's owner), and me on the phone ensued shortly after Meg’s visit. In that chat, Deb was able to determine that I was a knowledgeable horseperson who incorporated horses into a lifestyle. I, in turn, was able to garner that Deb cared deeply about Makia, (Hawaiian for; where attention goes, energy flows), but together they were not cohesive riding partners. She wanted the horse to have a good home that might provide the attention that could unlock Makia’s potential and allow her exuberant flow of energy to be useful. On the last Saturday of October, the north winds drove icy temperatures from Canada into the Adirondacks after a fairly comfortable and dry fall. Bundled in fleece and a wool cap, I spent the day waiting for the newest member of our herd to arrive. Late in the afternoon, the shiny silver exterior of a Judge Manning horse van pulled up in front of the barn. Makia was here at last! After a long winter in which I made Makia’s training and conditioning my priority among the horses, I began to sense that she had made real progress with her balance, patience and stamina. The mare's initial reaction to being ridden was to pull against the rider with the strength of a freight train. In frustration she ground her teeth and stewed in disappointment while bracing against the reins. The rider had no choice but to pull back and hold the mare’s head up. No wonder Deb didn't enjoy riding her, especially if it was not possible to devote daily training sessions to fix Makia's issues. At this point I didn't want to give up on my 'gift' horse, but I began to wonder if anybody else would ever be able to ride her. She left me exhausted and made me question if I was headed in the right direction with her training. The other piece of the equation required that Makia be given ample opportunity to spend her racehorse energy without limitations. Therefore, she was ‘chased’ before each ride. That means she was turned out with another horse, such as Sandi, (Just A School Horse), or Welby, (All Grown Up), and encouraged to run freely around the ring at top speed. If she felt the need to buck, roll or gallop, she was allowed to do so. When her rib cage heaved and her nostrils flared with every breath, I knew that she had spent most of the energy that got in her way under saddle. Once tacked up and mounted, Makia was able to focus on the schooling session because of the incredible work ethic she had inherited from her Thoroughbred genes. It didn't take me long to realize how serious Makia was about the world around her. This is a mare characteristic that I had not experienced since I owned Promise. Mares are wired to be mom’s and mothering is a survival skill. Makia had had one foal in her lifetime and that exposure was enough to flip the 'on' switch of her maternal instincts. Mares apply these behaviors to all aspects of their existence and training was no exception. Because Makia was in need of conditioning I constantly had to monitor her physical attention span because 'mechanically' she was not able to work for extended sessions. It took me a long time to read the signals and decide which ones should be heeded and which ones needed to be challenged more. Sometimes, I rode her through the woods on the mile of snow covered trail that encircles the farm. The groomed footing and crisp air worked wonders on her attitude…mine too. Many evenings I was able to work Makia in the outdoor ring. She always performed at her best under the flood light accompanied by music. These rides left me smiling all evening long and hardly able to wait until the next day when, conditions permitting, we might be able to work out there again. The indoor ring made Makia feel a bit claustrophobic and caused her to careen about in the smaller space. After dismounting I always threw my arms around her neck and hugged her tight. “You are such a good girl,” I beamed. A carrot or apple provided more tangible praise. By February Makia was able to teach a few riding lessons; two of her frequent riders became Meg's girls, Danielle and Emily. Around the first of May, Michele was on her way back to the Adirondacks after waiting out the winter months in Florida. She was eagerly looking forward to riding, but resigned to the fact that this summer she would not come to the barn to see that certain someone. Instead, she would simply ride anybody that was available. Still stuck thinking inside the box, I pictured her spending leisurely rides with Joshua, a hefty paint gelding, Spirit, a sinewy palomino American Saddlebred gelding, Lowtchee, a plucky Friesian mare, or Welby, my niece, Amy’s aged ex-racehorse. What I didn't picture was Michele making that special connection with any one of them. She loved them and had known them all for years but, she wasn't necessarily bonded specifically to any of them. Michele wasn't home 24 hours before she was on her way to the barn. It was good to have her back after a six month absence and she was eager to spend time with horses...any horses. She didn't care who I assigned her to ride that day but, first I had to introduce her to the new addition, Makia. Michele was instantly taken by Makia's gentle social nature. "Can I ride her?" she asked, casually. "Of course," I replied unable to think of a single reason why Michele couldn't handle Makia. As you can imagine, Michele and Makia hit it off from the first ride. Theirs is a different relationship from the one Michele shared with Murray. Where Murray was Michele's baby, Makia is Michele's peer, a sister of sorts who like Michele had one child and views the world from a mother's watchful eye and perspective. I am humbled by my doubts that Michele could ever find a horse with whom to form a special bond after the loss of Murray. A wise horsey friend named Jackie once commented, "We never stop loving them and somehow our heart can keep growing as the next horse is loved just as much, (although she), will never replace the one before." Sums it up for me...for Michele and Makia too. RIP Murray! Makia receives a lot of attention from Alex. This mare's affectionate social interactions extend to all of us. Makia's energy flows behind Easau in the Drill Team's finale gallop at Hoofbeats in the Adirondacks, 2012. But most of all Makia and Michele have found each other and , (with respect to Murray), have been able to establish a special bond. Makia and Michele demonstrated the canter when my class visited the barn last June. Earlier this week I posted the first installment of a three part saga, Where Attention Goes, Energy Flows...Part 1. The whole story is long and convoluted but hopefully, at the end of the final segment, the reader will breathe a sigh of bittersweet relief. After hanging up the phone, all that was left to do was wait. Back to the house I trudged to make breakfast for Rod, (The Dream Maker). Our surveillance system allowed me to watch Murray on the computer monitor from the kitchen and for the entire time, he appeared to be standing quietly. I puttered a bit around the house, trying to keep busy while waiting for the vet to arrive. Shortly after breakfast, Rod headed out to the barn to tend to a maintenance matter and of course to stop and see how the big gelding was doing. In less than five minutes he was back at the house with dire concern on his face. “He’s not looking good. He is covered with sweat all over his body. You need to do something,” he pleaded unable to bare the sight of any animal displaying discomfort. From the grainy image projected by the camera, the sweat was impossible to see. Murray was still standing quietly, but when I arrived back at his stall, his expression, and overall condition alarmed me. Immediately, I moved him into the wash stall and began to sponge him down with Vetrolin, a cooling body brace when added to warm water. Next, I covered Murray with a fleece cooler to prevent him from getting a chill. Finally, I walked him out into the driveway where the sun could help warm him up a bit. By this time he wanted nothing more than to drop into the sand and roll. Fearful that his abdominal pain had returned, I prevented him from doing so by keeping him moving. At 9:00 and just as Jean, (Friends and Blessings) was driving up the driveway, Murray planted his feet and refused to move any further. Now my mind was wondering if he was perhaps ‘tying up,’ a condition medically referred to as Azoturia. If this was so, the large muscles of his hindquarters were beginning to cook from a metabolic failure to eliminate lactic acid, a bi-product from anaerobic respiration. In addition, Murray was now sweating so profusely that a puddle of water was collecting in the sand from the drips along his belly. Even his ears were wringing wet. My level of anxiety was at an all time high as I searched in my head to make sense of his symptoms. No, I am not a veterinarian but, I have witnessed many cases of colic, one or two cases of tying up and an assortment of other conditions that torment horses. As an educated and knowledgeable horsewoman, I believed I was prepared to identify just about any common ailment that afflicts the horse from time to time. Thank heavens a vet was on the way! Just before 10:00, a large pickup truck appeared in the driveway signifying that help was finally here. The responsibility of trying to determine what was wrong with Murray was mine no more. Before I completely let go of my anxiety a tiny female with a long dark braid down her back and a pair of large Wellington boots emerged from the truck. She was so petite that her coveralls had been hoisted up and tied in position by a string behind her neck. I was immediately reminded of how we kept our bathing suit straps up on our shoulders when we were shapeless children. I have to admit here that it was difficult to accept this young girl as the professional that was going to save my horse. Thankfully, her warm smile and 'big girl' professional attitude were soon to ebb my concerns. Dr. Jennifer Nightingale had just graduated from Cornell University’s prestigious Vet school in May, '11. Yes, she was wet behind the ears and years from developing her craft and skill through hard knocks and experience. But, by the end of the day, she would prove to me what a great vet she was on her way to becoming. And after all was said and done, my respect for her is immense. But it was still the morning, and there was a long day to live through before I had a chance to sum up my regards for Dr. Nightingale. The Vet's first impression of Murray's condition ruled out colic. She was certain that he was experiencing something more metabolic in nature. She mentioned 'tying up' and wondered if he had in fact ingested something that was toxic. 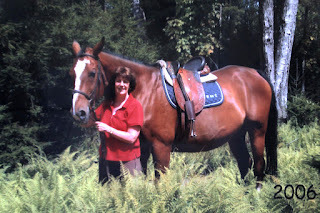 By this time, my boarder, Vicky, (Riding the Trails), had arrived to spend some quality time with her horse, Tango. Vicky is a veterinary assistant for the same clinic that Dr. Nightingale represents. Fortunately, the office that Vicky works for is fairly close by. Without hesitation, Vicky abandoned her plans with Tango and headed back to the vet clinic to run tests on vials of Murray's blood. While we waited for the results Dr. Nightingale began to treat Murray's symptoms. First she inserted a catheter into his jugular vein so that she could replace the precious fluids seeping out through his skin. My other boarder, Irene, (Hannah Says Goodbye), was also present by this time, offering her support with the utmost concern for Murray. Suddenly, we all became aware of a loud thumping sound pounding from inside of Murray. Dr. Nightingale issued a warning for us to stand clear for she worried that he might drop at any second. In that instant it hit me that there was a very good chance that we might be fighting a losing battle with Murray after all. The race was on to try to save him. While the fluids dripped into Murray's body there appeared to be a brief recovery of sorts. The thumping slowed and dissipated while the horse's skin began to cool and dry. He stretched to urinate; a sign that the fluids were doing their job. However, the urine was dark and the amount limited. For several hours Dr. Nightingale worked on Murray. The blood tests indicated that his kidneys were the source of trouble; yet another finger pointing at toxic ingestion. What in the world could he have eaten? Eventually, Murray appeared to be holding his own and the Vet, having done all that she could for the time being, prepared to leave. Before she disappeared she set me up with vials, syringes and liters of lifesaving chemicals accompanied by several handwritten pages of instructions. Many of the medications were substances that I had never heard of. They had to be carefully recorded and kept track of for they were also controlled substances. My stomach felt sick looking at all these measures that might or might not save Murray. I believe at this time I knew that we were eventually going to lose in the end. But my heart wanted to keep going, because there was a chance and I wasn't yet able to accept that Murray had eaten something on my carefully maintained property for horses. It was all too much to accept...yet. As Dr. Nightingale drove away from our farm, the feeling of helplessness returned with a vengeance. And shorty thereafter, so did Murray's symptoms. By mid-afternoon the powerful sweats had returned and Murray was clearly uncomfortable, indicated by his bulging eyes and grinding teeth. Between Jean, Irene, Vicky, (having returned from testing blood at the vet clinic), and I, we never left him. Luckily, when I called Dr. Nightingale to report the latest observations, she had not yet left the Adirondacks. In a short period of time she was on her way back to Moose River Farm. One of the first observations that I made of Dr. Nightingale was her willingness to confer with colleagues by phone when she had questions about how to treat Murray. This impressed me. It showed that she lacked ego and wanted the best outcome for my horse despite her limited time in the field. It ultimately made me feel that Murray was under the best care and that many professionals were putting their heads together to see to it. Upon Dr. Nightingale's return there was only one treatment left to try; the diuretic, Lasix. It was also clear that Murray's extreme discomfort was stemming from an inability to urinate. As hard as he strained, pushed and willed himself to do so, no relief resulted. What little did squeeze through was thick and brown; clearly not a good sign. With one more valid treatment and an agreement that if this didn't work, the kindest thing to do would be to put him down, the final attempt was made. In the end, it wasn't meant to be. After we waited and prayed for 20 minutes, Dr. Nightingale headed out to her truck to prepare the one injection of the day that would have a lasting effect on Murray. I led the big gelding out, slowly, along the same path that Windy and Spy had taken to their final resting places. My whole body was numb, a necessity at this time to prevent me from feeling the enormity of my decision to end a loved one’s life. Dr. Nightingale and Vicky followed us out to the spot where Rod would inevitably dig the hole that Murray’s body would vanish into. I kissed the bridge of his nose and hugged him tight as tears burned in my tired eyes. The Vet was swift and quick after asking if I was ready. With a nod of my head she plunged the first syringe full of blue juice into Murray’s catheter. The effect was immediate. Murray’s large physique dropped to the ground so quickly that it almost rolled completely over from the force. Through my tears I looked up at the Vet and said, "Wow, you're good!" Through her own tears, she half-smiled in reply. Dr. Nightingale then quickly plunged another syringe full of the heart stopping liquid through the catheter to make absolutely certain that her mission had been accomplished. Moments later her stethoscope confirmed that Murray was gone. She left me there to pack up her truck for the long road home. Only then was I aware of Vicky making her way back to me. She had gone to the barn to get scissors so that I could cut a lock of my own hair and braid it into Murray’s mane; a piece of me to be with him forever in the ground. My short hair made the task difficult but manageable. Vicky had also returned with several hairs that she had plucked from Michele’s riding helmet. Her gesture to think of Michele at this time was most touching. We tucked the hairs inside Murray’s ear as a token of Michele's love and devotion to him. It was now late afternoon and the drama of the past twenty-four hours had come to an end. All that was left to do was tend to the other horses still alive and well on the farm and in need of our undivided attention. Back at the barn I was feeling overwhelmingly sad. Vicky sent me to walk the dogs and goats while she tended to the horses. I took her up on the offer and immediately collected my charges and headed out into the woods. For the entire walk my mind was a blur as the events of the previous hours replayed over and over. What could I have done differently? Should I have called the vet sooner? Should I have not left Murray out on the lawn to graze yesterday? This was the first horse that I had been responsible for putting down due to an acute condition that could not be fixed. The feeling was so unfamiliar to me. Windy and Spy had required planning and Promise, (Summer's Promise), of course had taken care of the matter herself. But Murray had been ridden in a lesson only 36 hours prior to his demise. What had gone wrong? As the dogs, goats and I turned for home a new thought popped into my mind. I had two tickets to attend a concert given by melancholy 70’s artist, Janis Ian for that evening. She was giving a small intimate performance at Great Camp Sagamore in Raquette Lake. Vicky and I were planning to attend but decided not to when the events of the day had become so dire. There was still time for us to get ready and go. By the time I returned to the barn, I was prepared to talk Vicky into going to the concert. “Let’s go anyway. What’s done is done and there is no reason that we shouldn't go,” I reasoned. Vicky hesitated. The day had been long for her too but, in the end she saw my point. We weren't leaving the patient to attend the concert. We were escaping the scene of the despair. Perhaps we might find comfort in Ian’s sad lyrics from songs such as At Seventeen, In the Winter and Tea and Sympathy. We were right! our seats were less than 20 feet from Janis Ian’s acoustic stage setting. Her soothing vocals and depressing verses put me in a state of catatonic appreciation, allowing me to wallow in heartache. For the first time that day I did not fight the sadness; instead I let it penetrate deep into my core. M & M enjoying each other's company against an Adirondack background. Today's post is actually the first installment of three. While writing one story I realized it could not be told without another but, the length would be a bit much to read all at once. Therefore, I have broken them up into three segments that will be posted in the days to come. Enjoy! Those dreaded words were slipping through my friend Meg’s lips while she adjusted her daughter, (who was sitting on top of Zambi, (Riding Zambezi)), Danielle’s stirrup leather. Reflexively, I gave her my canned answer; “No thank you, the barn is full and I really don’t want a mare. Luckily, Meg kept the horse in our conversation over the next year and a half. “No room, no mares, no thank you,” I replied. And so the conversation continued back and forth between Meg and me until August of 2011 when great sadness enveloped the barn. One week before the new school year was about to begin, Murray, an aged bay gelding of mine began to exhibit signs of colic or extreme abdominal distress. The symptoms are enough to send a bolt of fear through every horse owner’s body. While the horse nips and kicks at his sides, attemps to lie down to roll, and refuses to eat, the owner must decide whether or not the case is severe enough to summon the vet. Our vet clinic is an hour away, but it may take the vet as long as 2 to 3 hours to arrive, depending on the current case load. Before making the decision, I followed my standard protocol of walking the horse in hopes that his intestines might dislodge the gas or source of discomfort. Murray and I walked round and round the 'island' in our driveway stopping every once in awhile so that I could assess any improvement in his condition. When there appeared to be none, I decided to inject him with a strong pain killer that would at least, relieve his discomfort until the gas dissipated. By early evening, Murray’s symptoms appeared to be subsiding, but his appetite, had yet to return. Eventually, the heat of the summer day released its grip as darkness began to fall. By then, Murray had chosen to lie quietly in his stall and rest. Due to my elevated concern, I dragged a portable hammock from our patio out to the indoor arena where Murray was living. By the time I wrapped myself in a blanket and curled up in the hammock, Murray seemed at ease. All that separated the two of us were the metal fence panels that had been fabricated into a temporary stall to house ‘just one more’ horse now living in my indoor ring. Due to Murray’s good nature, confident personality and lack of anxiety about being alone in the indoor ring, he was the fitting choice to reside out there. In truth he was less than thirty feet from the rest of the herd. A check of the time revealed that it was close to 11:00. I reached my hand out through the rails of the panel and lightly stroked Murray’s ear and jowl. His eyes closed and his breathing became the normal wheezy effort that horses, lying heavy on their lungs, produce. In that moment I was acutely aware of the clear summer sky; its sparkling lights and waning illumination from the crescent moon conducting all that twinkle through the large door. With my hand on Murray’s face, I began to wonder if his condition was more serious than the gas colic I had treated him for earlier that afternoon. The weight of this worry now turned its attention to my friend Michele, (Friends and Blessings), Murray's financial sponsor through the summer months. Where I was Murray's caregiver, providing him with all of his equine needs, Michele was Murray's mother. This role she played dutifully with every carrot that they shared, every grooming session they spent engaged in conversation and every ride where they traversed the Adirondacks basking in each other's company. At this point, Michele was not even aware that Murray had taken ill. I resisted the temptation to call her because she was scheduled to take pictures at a wedding the following day. Fearing the news would prevent her from clearly focusing on her job, I had chosen to wait until after Saturday to tell her. As crickets and frogs serenaded Murray and me under that brilliant night sky I fell asleep. Two or three hours later I woke up shivering under my lightweight blanket. Murray was still resting comfortably so I decided, reluctantly, to seek out my warm bed in the house. Early the next morning, after a restless night in which I had gone back out to the indoor arena to check on Murray twice, I got out of bed and dressed quickly. The air was warming up with no clouds to hinder the process. I found Murray dozing on his feet. His appetite had yet to return but, he was not displaying any signs of colic either. After feeding the rest of the hungry herd, I called the vet clinic. It was only 7:00 a.m. but, luckily a voice answered the phone thus, setting into motion the events of the coming day. Every great couple deserves a moniker. Michele and Murray became affectionately referred to as M&M! Handsome Murray taught many with his intelligence and patience. "Don't you have any cats?" Its a common question asked by many of our visitors. Surprised by the answer, guests often wonder how we keep the mouse population, (an expected problem in any barn), under control. Our two West Highland terriers are pretty good mousers who, along with a nomadic weasel, tend to the task themselves. I grew up with cats. In fact I can't remember a time in my childhood when at least one cat wasn't living in our house. On my eighth or ninth birthday I received a calico kitten who, sadly, grew into a holy terror of teeth and claws. Alice never could be 'tamed' and therefore, I never established a close relationship with her. She was permitted to have a couple litters of kittens who my siblings and I adored before they all found suitable homes. One of them, (a calico), was adopted by our neighbor, Rich Coleman. The kitten was christened with the name Steve, (Steve McQueen), and kept the name even after a veterinarian announced that Steve was a female, (All calico cats are female!). 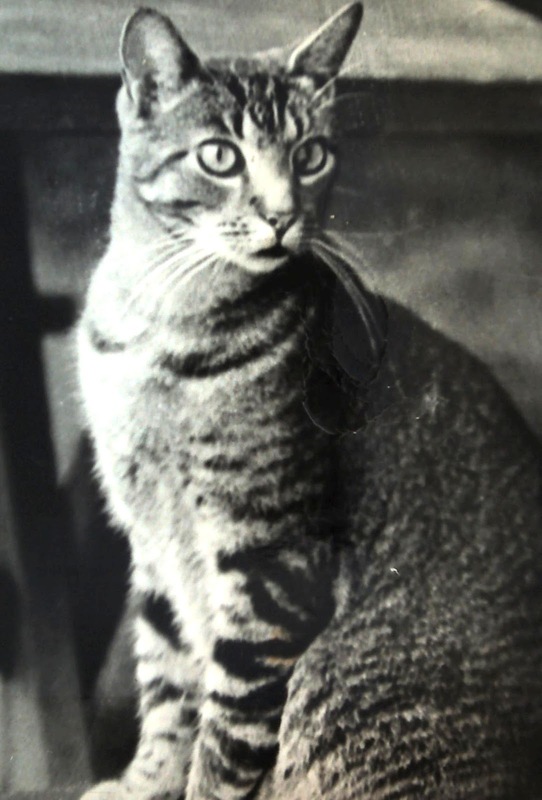 Later, an orange tabby female kitten grew up into an aloof member of the family. She kept to herself, only appearing at mealtime and rarely interacting with her family. Although we named her Cindy, my mother refused to call her that since Cindy was the name of one of my brother's girlfriends; a young woman with way more experience than my mother thought George could handle. Anyway, my father never acknowledged Cindy the cat in all the years that she lived with us. However, there is a memorable moment in our house when he referred to her simply as the 'tan one'. Apparently, he didn't even know her name. There was also a black with white, (tuxedo), cat that we named Oliver due to his orphaned status. One summer my brother George was working for a company that manufactured and sold advertising signs. For days he came home with installments from the continuing saga of a pregnant stray cat seen sneaking around the plant. The manager was planning to kill the cat once she was caught. At dinner each night, Sue, John and I listened with our eyes wide open as George expressed great concern for this animal. Once her babies were born, the manager did catch and kill the mother along with several of her kittens by drowning them in a nearby river. For some reason, two kittens were left behind and George and another young co-worker, unable to bare the outcome of this situation any longer, took the remaining kittens home with them. All I remember about Oliver, was that he was so tiny, we had to feed him with a bottle. My mother took care of him as if he was her own baby, and indeed he was. Oliver's story haunted every member of my family, including my father. If we learned anything that summer from such a tiny being, it was to garner respect for all forms of life. Oliver's arrival, although quite sad, strengthened our family bonds and pulled them a little tighter. In addition to these unforgettable feline characters, there is still one cat who stands out above all of the ones listed above. For eighteen years he remained a constant in the fabric of our family's backdrop as the four of us grew into our teens. He endured the arrival of kittens, puppies, and an assortment of other critters who arrived temporarily from time to time. Henry's story begins when his elegant black and white mother, Mittens began to push and strain into labor with no results. Slightly alarmed, my mother whisked Mittens off to the vet where an examination diagnosed that the first kitten was not only in breech position but, was also blocking the progress from those stuck behind him. With the vet's assistance the first kitten was pulled out tail first. Once he was free, the rest of the litter poured out right onto the exam table. Mittens took good care of her babies and while they were with her, my older brother was encouraged to pick one to keep. Naturally, he picked the large male tabby who came posterior first into the world. George named him Henry after his baseball idol, Hank Aaron. Henry grew into a beloved member of our family. His emotionless expression, punctuated by two emerald green eyes was a fixture no matter where our family gathered in the house. As an indoor/outdoor cat, he was everywhere all the time. If we were visiting with neighbors in the courtyard behind the kitchen, Henry was sitting on the stone wall listening to the conversation. If we took the dog for a walk around the block, Henry followed us, darting in and out of the foliage like a clandestine spy. If we were playing Wiffle ball on the side lawn, Henry was sunning himself in the driveway. And if I was agonizing over a page full of long division problems while seated at the desk in the pantry, Henry was surely stretched out on my math book preventing me from successfully completing the task in a timely manner before bedtime. There are many family tales in which Henry stars as the main character but, two of them are worth recording with words. Grammie, ( I Will Build Myself a Farm), was one of Henry's biggest fans. Every Christmas she sent him a catnip toy, specially wrapped and tagged with his name. Never a procrastinator, Grammie sent a whole box of gifts, including Henry's, weeks before Christmas. Once it arrived the box rested inertly on a Queen Anne chair in our front hallway. It didn't take our cat long to notice the box and within moments of its arrival, Henry keenly aware of the package and the contents within, remained near the package at all times. He slept on it, sat on it, licked himself from head to toe on it and never left it for very long. Finally, Christmas arrived and within seconds of being presented with his catnip mouse, he tore it open so that he could roll ecstatically in his 'weed'. For days afterwards he strolled around the house, stoned from his catnip binge. It was not uncommon for us to greet him with a peace sign hand gesture and say "Hey, man, what's happenin'?" 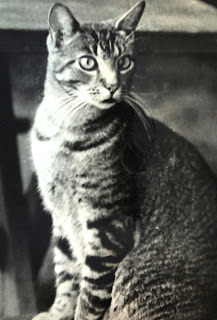 The other 'Henry' story is a bit more serious and goes down in our family history with a glimpse at our father's concern for his family's cat. The timeliness for telling this story is ironic, considering that the tale begins in Avalon, NJ which suffered damage from the assault of Hurricane Sandy earlier this week. My family rented a house in Avalon, every summer during the years that my siblings and I were growing up. Until we owned a boat, (early 1970's), we rented an assortment of cottages within walking distance of or a short drive to the beach. In Henry's early life, Avalon was a sleepy seashore village dotted with an eclectic array of yellow, blue, gray, pink and green clapboard bungalows that lined the grid of numbered streets and avenues crisscrossing the island. Initially, we took Henry with us on vacation despite his dislike for riding in the car and being away from home. Once we arrived at our rental cottage, Henry established a strict routine by staying out all day and returning to the cottage just before dark every evening. Throughout the day we caught glimpses of him here and there, but never seemed to worry about him as he always returned by dusk. At the time, Avalon possessed many scrubby empty lots that were years away from being built up with more seashore homes. Henry spent his day hiding in the tall grassy lot next door or peeking out from behind the lattice slats that skirted the foundation of the cottage. Whatever he was up to, we never knew, and although I would never let a cat out of my sight in today's busy vacation hot spots, the practice was widely accepted in the late 60's. Since we returned home with Henry in one piece at the end of the vacation, the matter was never a concern. That is until the year that Henry accidentally exited the cottage on the morning we were packing to go home. The family version of the story pin points me, the youngest, as the accomplice who may have opened the door allowing him to escape. Regardless of who sprung the cat; Henry was gone, lickity split! And according to his internal clock, not due back until dark. After lots of blaming and scolding, the fact still remained that Henry was not available to make the trip home with us in the car, now packed to travel two and half hours back to Philadelphia....away from our dear cat. With no other choice and with lots of wailing tears, we drove away in our station wagon. I don't remember much about the trip home, but I can imagine it wasn't very pleasant. I do, however recall a sense of urgency as we unpacked the car once we arrived in our driveway later that afternoon. The boxes, suitcases, bags of food, and assortment of beach toys were no sooner unloaded from the station wagon, when my brother, George, (age 10), and my father backed out of the driveway and headed back to Avalon! Their arrival at the rental cottage, shortly before sunset, was timed perfectly as the new renters were beginning to wonder about the cat camped out on their front steps and yowling to get in. With a meow of recognition and relief, Henry willingly submitted to being placed in the station wagon for its second trip home that day. The last thing I remember from this family crisis was that my brother George, with Henry in his arms, visited my sister Sue, brother John and me at our bedsides to let us know that Henry was safe and finally home. After writing today's blog entry, I am beginning to ask myself why there are no cats at Moose River Farm. I love cats and look forward to the day when one takes up residence in my life once again. Until then, my memories of Henry, Oliver, Cindy and the rest will comfort me with meow-echoes from the past. Henry was a beloved family member for about 18 years .